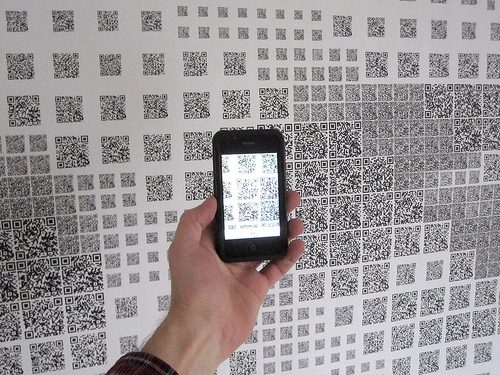 QR Codes: What Are Those Things? You’re seeing them everywhere. They’re little boxes with barcode scanner print in them and they’re taking over the world. You may have seen them on flyers for events, in store windows, on bottles of wine or even on someone’s forehead. But what are they and what is their purpose? Ah, my friends; their usefulness has only begun to be tapped and we shall see many creative uses soon. QR Codes are little scanner boxes generated on many free sites that link to a website, be it an actual site or page or even an event or promotional product. Companies are tailor-making these little guys to fit with company logos and even code portraits into them. They are intriguing and useful, and they save a lot of printing, but why aren’t they even more prevalent? The challenge of these doo-dads is that the only way to use them is if a customer has an application on their phone (iphone or droid) that will scan the code and link the person to your site. Thus enters “deck syndrome”: a person doesn’t want to go the the app store and download something new that isn’t already included in their phone’s repertoire. But don’t worry, the “cool factor” will force smartphone owners to jump on the bandwagon and download the free apps soon enough. You want to be able to say so much to your customers and hook them in without having to spend extra money and use precious ad space on content. “Read about the vineyard from whence this bottle of wine was forged” becomes a burden and thus steps in your little QR code. Point, shoot, scan, boom!…you got yourself a visit from an interested patron. 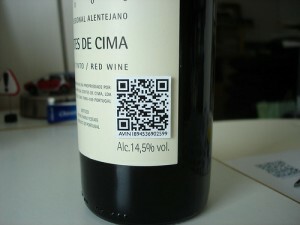 It’s so easy, even winos can handle scanning the codes! In Korea, you can scan products on a big sign at the train station and when you return home your groceries will be delivered to you. You can create a spotify remix and the person goes right to that mix you made, or record a voice message and a QR tag on a present will lead the recipient to the recording. Big companies like Best Buy are using them to link you to a product’s description. No more Google searching to try and match up a serial number; these companies are benefiting greatly from having pages of content and customer reviews readily available in a tiny little picture box. If you have amazing content and/or an incredible event to promote, create your own QR Code logo so you really stand out. The codes are still so novel that people will actively scan them, but when the novelty runs out you’ll need pretty pictures and snazzy paragraphs just like in the old days. the word “QR Code” is a registered trademark—don’t forget! don’t put them in emails—just paste the link to your content! At the end of the day, if you don’t show the consumer immediate value in the content to which they are directed via the QR code, you’ll not only lose out on a customer but you’ll be letting down all the technology users in the whole world. So get your content entered and make sure it will be worthwhile before you create a QR code. Scan on, my friends!